Detoxing and cleansing is all the rage this year. There's 60-day juice cleanses, detox powders and pills, and detox programs popping up everywhere. Detoxing or cleansing may also be a way for someone to hide disordered eating habits. As this article suggests, cleansing is society's most acceptable form of an eating disorder. Natural detoxification programs can be an great way to amazing health and newfound energy because we are exposed to many, many toxins living in a modern society - in our food, cosmetics, environment, and more. Instead of fearing all toxins, you can focus on choosing natural foods and products. Excretion - gets the toxin out of your body! Phase I is like taking the garbage from the various cans in your house to your big trash can in the backyard or side yard. Phase II is like taking the large garbage can out to the curb. Phase III is like the garbage truck coming and removing the contents of your garbage can.” You need all three steps to stop the garbage from collecting inside or outside your house. Try one or all 7 out this week, and notice if you have more energy! Cruciferous veggies like broccoli, cauliflower, kale, and Brussel sprouts. These veggies support the Phase II liver detox. They are a triple threat because they are anti-inflammatory, detoxifying, and are stocked with antioxidants. Thankfully, these are some of my favorite veggies, and kale is almost always in my fridge. If broccoli is the only cruciferous veggie you eat, try out roasted brussel sprouts, kale chips, or sautéed kale and garlic. Once your liver has done its job, your body wants the toxins out of your body. Staying well-hydrated with water will help keep things moving out. If you’re backed up from dehydration, all those toxins will sit put into your body and can be re-absorbed into your system. Carry that water bottle around with you all day, and stay hydrated with other fluids like herbal teas and soups. In order to detoxify, your liver needs enzymes. To build these enzymes, you need protein! When you do a juice cleanse, you’re taking in almost no protein, and your body will breakdown its own muscle proteins for enzymes. Your liver’s detox system may slow if it doesn’t have enough of the proteins, and you may end up even more fatigued because you’re using your body’s protein stores! Instead, choose to include high-quality proteins at all your meals and snacks. 4. Serve up garlic and onions. If you want to add flavor to a soup or a meal, just throw in some garlic and onions. Your taste buds and liver will love you for it. Sulfur-rich foods like garlic, onions, and egg yolks support liver detoxification and may bind heavy metals. 5. Choose unprocessed, whole foods. Your body recognizes whole foods. Choose delicious, nutrient-packed whole foods like fruits, veggies, nuts, eggs, and other 1-ingredient foods for optimal health. Buy organic foods using the Dirty Dozen and Clean 15 list. This doesn’t have to be expensive or time-consuming. Start meal planning and prepping, find a new recipe or two each week, and focus on small behavior changes. 6. Limit alcohol, caffeine, and sugar. Our livers are pretty resilient. If not, none of us would have survived college. When you’re busy detoxing from last night’s margaritas, your body won’t be able to focus processing other toxins. The double whammy is sugary alcoholic drinks. If you drink, try to limit it to 1 drink for women and 2 for men. Caffeine is mixed because coffee is an antioxidant, but if you NEED caffeine to get out of bed and function all day, try cutting back on it. I say limit but not eliminate because many people enjoy a glass of red wine, piece of chocolate, and cup of coffee. Life is not about eliminating all pleasures, but it is important to pay attention to how much you’re taking in and why. Savor it when you do have it. 7. Add flavor to your food with herbs and spices. Plain, steamed broccoli is boring! Spicing up your food with herbs and spices adds a ton of flavor and bonus phytonutrients. Many herbs are detoxifying as well, like parsley and cilantro. Cilantro may help detoxify heavy metals from your body. Get creative, and try out a new-to-you fresh herb each week. Throw a handful of cilantro in a smoothie, or top your chicken with oregano. Have fun in the kitchen! When your body is overexposed to toxins to our body like alcohol, sugar, artificial sweeteners, and more, it won't be able to keep up and process everything. Instead of getting rid of the toxins, your body often stores them in your fat cells. They can throw your hormones out of balance, influence your weight, and make you majorly fatigued. 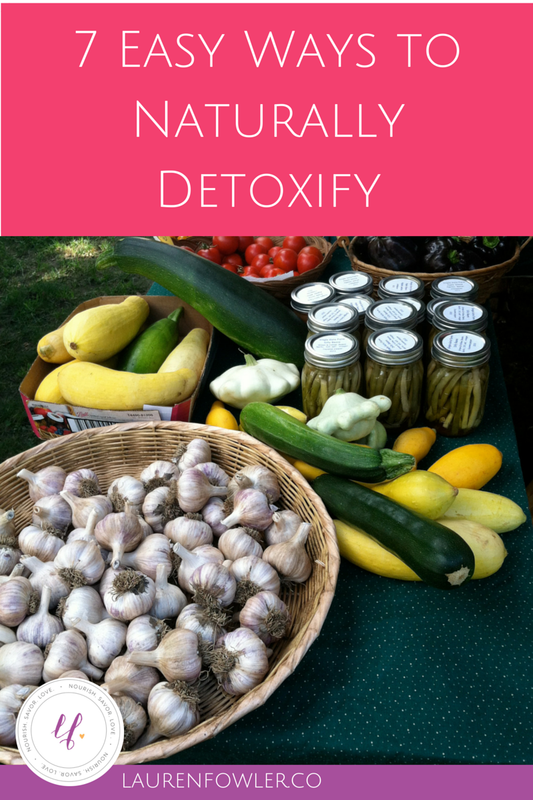 When you support your natural detoxification system, you'll work on eliminating these toxins. You may notice more energy, better skin, weight management, and just overall health and vibrance. Just by making small changes like adding a serving of kale to your day and replacing your afternoon sugar-filled coffee with a cup of tea, you'll notice a shift in your health. You don't need to end up starving on a juice fast to detoxify! Start with these tips, and see what happens. What's your favorite detoxifying food?